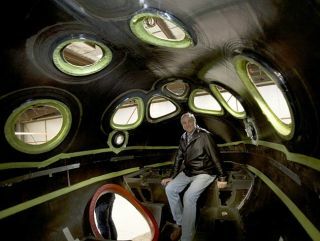 Burt Rutan sitting in the shell of SpaceShipTwo during its construction. Rutan made history as the designer of SpaceShipOne, the first privately funded space vehicle to reach suborbital space during the Ansari X-Prize of in 2004. Renowned aerospace designer and leadingarchitect of private space travel, Burt Rutan,has announced that he plans to retire next year. Rutan has worked in California's Antelope Valley for more than 45 years, initially as aflight test project engineer for the AirForce. In 1974 he founded the Rutan Aircraft Factory to develop experimentalaircraft for homebuilders. In 2004, Rutan made headlines around theglobe as the designer ofSpaceShipOne, billed as the world's first privately-built pilotedspacecraft to reach space, and as winner of the $10 million Ansari X Prize, thecompetition created to spur the development of affordablespace tourism. "Breakthroughsare what define our species," said Rutan. "Manned spaceflight is notonly for governments to do. We proved it can be done by a small companyoperating with limited resources and a few dozen dedicated employees. The next25 years will be a wild ride; one that history will note was done foreveryone's benefit." Rutanhas amassed a long list of breakthroughs in his career, such as designing thelegendary Voyager ? the first aircraft to circle the world nonstop ? withoutrefueling. He also developed the Proteus high-altitude, long-endurance test bedaircraft. Otherrecent projects include the VirginAtlantic GlobalFlyer, which broke the Voyager's record time and enabled thefirst nonstop, solo flight around the world. "Burt is known worldwide asa legendary genius in aircraft design in the aviation world. I am veryfortunate andproud to have worked by his side for the past28 years," said Scaled president Douglas Shane in a Nov. 3 statement. Will Whitehorn, president of Virgin Galactic ?the suborbital spaceline operator of the WhiteKnightTwo/SpaceShipTwolaunch system now under development by Scaled Composites and backed by UKadventurer and businessman, Sir Richard Branson ? commented on Rutan'sretirement announcement. "To say something about Burt is simple ? he is a genius and an inspiration to a whole generation nowwanting to push the frontiers of aerospace technology," Whitehorntold SPACE.com. "I don't believe Sir Richardwould have shown the amazing vision he had to back the risk capital inSpaceshipTwo's early development phase if it had not been Burt and Scaledbehind the X prize-winning vehicle on which our beautiful commercialvehicles are based." VirginGalactic has been making steady progress with its SpaceShipTwo vehicle, whichhas flown two glide test flights and is poised to soon begin its firstrocket-powered flights. Whitehornadded: "Burt is the Leonardo da Vinci of modernaerospace and his work will be remembered in the centuries tocome."